Check out our men’s custom printed singlets. Design yours online now, we realise your ideas all-over and full colour sublimation printed on your shirt! Start by choosing one of the fabrics and sewing patterns, our online shirt-designer will automatically pop-up allowing you to upload your photos, graphics and logos. You can place them wherever you like. 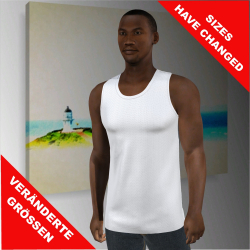 The 3D preview shows your customised singlets at any time. Go ahead!